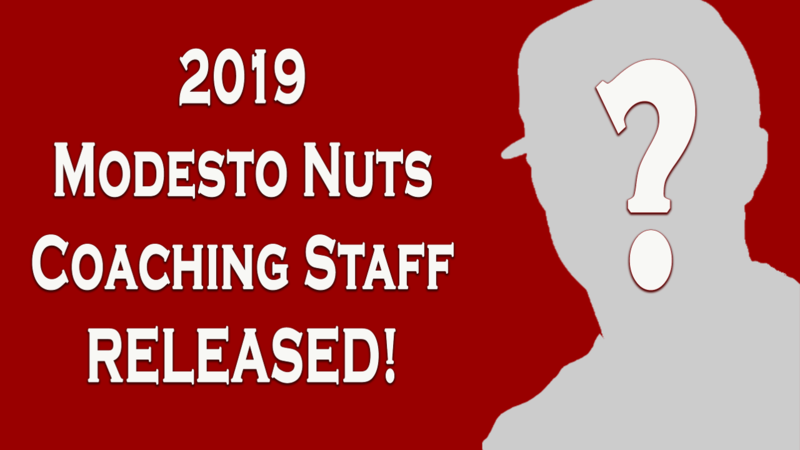 Modesto, CA - The Modesto Nuts are excited to announce an entirely new field staff to John Thurman Field. Denny Hocking, 13-year Major League veteran, will be the manager. Nine-year veteran in the Mariners organization, Jose Umbria, will serve as the Nuts Hitting Coach. Rob Marcello, new to the Mariners, will be the Pitching Coach in Modesto. After serving in Clinton (A) together last year, Taylor Bennett comes to Modesto as the Trainer and Michael Sadler will be the Performance Coach. "2019 is really shaping up to be an exciting year." said Zach Brockman, General Manager of the Modesto Nuts. "Seattle has been a phenomenal partner. They understand the importance of both play on the field and community involvement. We're looking forward to welcoming this year's staff with open arms." Hocking will begin his third season in the Mariners organization and his second as manager after leading the Clinton LumberKings in 2018. In 2017, Hocking was the Hitting Coach for the AAA-Tacoma Rainiers. Prior to joining the Mariners, Hocking was a member of the Angels organization for four seasons which included two years as the Inland Empire 66ers' manager in 2014 and 2015. The Torrance, CA native was drafted in the 52nd round in 1989 and reached the Major Leagues in 1993. In 13 seasons, Hocking compiled a .251 career average with 25 home runs and 226 RBI in 954 games with Minnesota (1993-2003), Colorado (2004) and Kansas City (2005). Umbria starts his ninth year in the Mariners organization after serving as the Clinton LumberKings' Hitting Coach in 2018. He spent the 2017 season as a coach for the AZL Mariners and the 2015 and 2016 season as manager of the Dominican Summer League Mariners. He also spent the 2014 year as coach for the AZL Mariners and the 2010-2013 seasons as a coach for the Venezuelan Summer League team. Prior to joining the Mariners, Umbria coached in the Paralela League with Lara in 2008. Umbria originally signed by the Toronto Blue Jays as a non-drafted free agent in 1995 and played in the minor leagues until 2005. He won the 2004 Eastern League Championship while playing for the New Hampshire Fisher Cats. Marcello gets his first assignment within the Mariners organization. The Nuts' new pitching coach had been working as the Director of Pitching and the Director of Operations at Top Level Athletes, a training facility in Florida. The Roswell, GA native pitched at Appalachian State University before being drafted in the 17th round of the 2013 draft by the Phillies. He pitched one season in the New York Penn League for the Williamsport Crosscutters. Marcello has also spent time as a collegiate coach at Indian River State College, St. Petersburg College, and Rollins College. The Modesto Nuts Professional Baseball team is the California League Class A-Advanced Affiliate of the Seattle Mariners. The Modesto Nuts is the Central Valley's place for family, fun, affordable entertainment. For more information on season tickets, group rates, sponsorships and more visit modestonuts.com or call 209-572-HITS (4487). Follow the Modesto Nuts on Facebook, Instagram and Twitter.